Democratic presidential candidate Jay Inslee wants his party to scrap any thoughts of impeaching President Donald Trump and instead focus on voting him out of office. “We should have a dramatic, engaged, concerted, energetic and successful effort in November 2020 to make Donald Trump a blip in history,” Washington Gov. Jay Inslee said during a CNN town hall Wednesday. He said damning details still could emerge about Trump’s 2016 campaign and business dealings but added that a Republican-led Senate would never remove the president. Jay, an underdog in the crowded 2020 Democratic field, faces pressure to raise his profile in a campaign dominated by other better-known figures such as former Texas congressman Beto O’Rourke and Vermont Sen. Bernie Sanders. 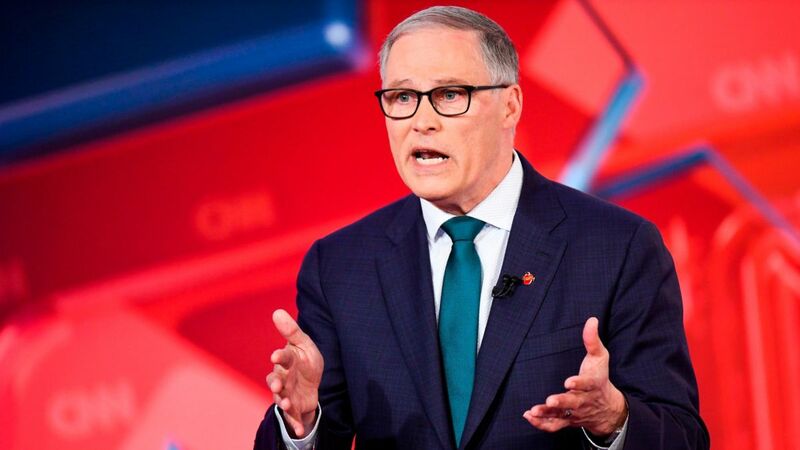 Inslee, 68, used the spotlight to emphasize his focus on combating climate change while noting his record as a liberal governor and his generally sunny approach to politics — a package that, he argued, makes him an ideal foil to the Republican president. And he noted that after initially opposing Washington state’s move to legalize marijuana, he now realizes that fears of rising crime and rampant use were overblown. He has since pardoned about 3,000 nonviolent marijuana offenders and said he wants the drug legalized nationally. About six weeks into his campaign, Inslee acknowledged the stakes he faces as the contest shifts into the next phase. He tacitly admitted he’s yet to reach the grassroots fundraising threshold that would qualify him for the Democratic National Committee’s June and July debates — key opportunities for longshot candidates to gain attention and catch fire. Inslee will follow his appearance with a multiday campaign swing through Iowa, New Hampshire and South Carolina, three of the first four states to cast caucus and primary ballots next winter.